The Pan-American Highway runs from Alaska to Patagonia. It’s a classic overland road (and offroad) trip with a reputation for wilderness and adventure. Most people tackle it in a 4x4 truck. Paul Guschlbauer is going about it differently. He’s flying the whole way. From the northernmost point of the United States on the Arctic Coast in Alaska to the southernmost city in the world – Ushuaia in Tierra del Fuego, Argentina. He calls it his Project "Overland". 18,000 kilometres as the crow flies – 14,000 of them through mountain ranges – in 100 km stages, through 17 countries and two hemispheres. Paul will be crossing outback terrain where runways are few and far between in his 50-year-old, two-seater Piper Super Cub bush flying prop plane. Its oversized tires, off-road suspension and additional fuel tanks mean that he can land and take off almost anywhere. The plan is to stop along the way and explore remote, unique mountain areas that would be otherwise inaccessible, to paraglide, ski, climb and more. Paul is not flying completely blind on this adventure. In 2016, His friend and mentor, Ken MacDonald, one of the best bush pilots in Alaska, or the whole world even, helped him to find and buy his old Super Cub N3995Z and taught him how to fix it, and offered his knowledge and a place to sleep. Paul spent three months with Ken, exploring the mountains of Alaska by plane, climbing them and paragliding from the summits. His support team includes Mike Castillo, an American pilot who lives in Panama and has over 28 years of flying experience and an extensive background in bush flying, much of it in Baja, Mexico to find the best remote surf spots. Paul is also supported by flying-legend André “Andy” Hediger, paragliding pioneer and former world champion in a number of flying sport disciplines. The Swiss pilot lives in La Cumbre, Argentina where he founded the AeroAtelier flying sport academy. The trip officially begins on June 21, 2018 – the longest day of the year in the northern hemisphere and finishes on December 21, 2018 – the longest day of the year in the southern hemisphere. From summer solstice to summer solstice. Paul is carrying his supplies with him and refuelling en route. 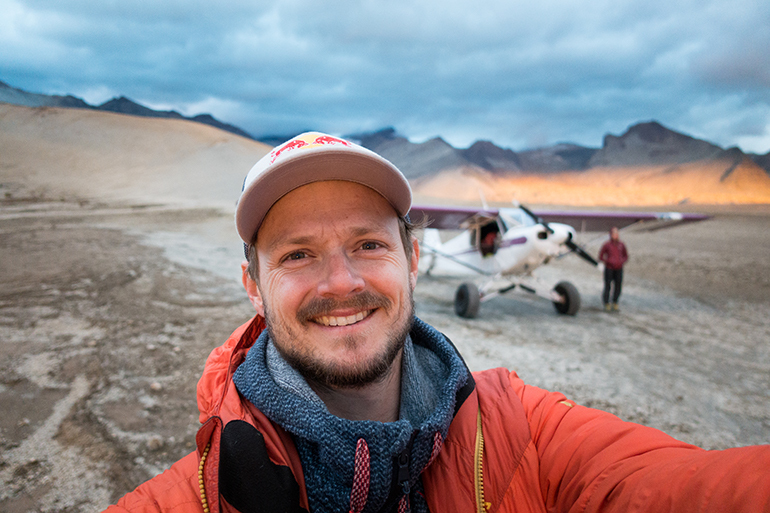 The little plane will be neatly packed with everything he needs: paragliding gear, skis, climbing equipment, a small tent, food and drink. And tools, because if the Super Cub breaks down, Paul will have to fix it himself. Paul is setting out from Prudhoe Bay, North Alaska – a settlement of just 2,000 people above the Arctic Circle. Alaska – 1.7 million km2 of wilderness and adventure, where he will be looking for high, remote landing and launch sites. This is aviation off-road. His itinerary includes an expedition on Mount McKinley, the highest mountain in North America (6,190 m, 20,310 ft), a visit to Burning Man, where the Black Rock City Airport, FAA identifier 88NV, exists for only two weeks a year. In Central Ecuador in the Andes, he plans to climb Chimborazo, an ice-capped inactive stratovolcano in the Cordillera Occidental range of the Andes. With an elevation of 6,263 m (20,548 ft), Chimborazo is Ecuador’s highest mountain and a sought-after climb. The Project Overland Pan-American journey ends in Patagonia, a place that speaks for itself. Adventure is simply everywhere down there. Paul says that it is his dream trip, because it’s the culmination of everything he loves – flying, exploration, and adventure.